We are happy to announce our first field trip for the 2016-2017 school year. 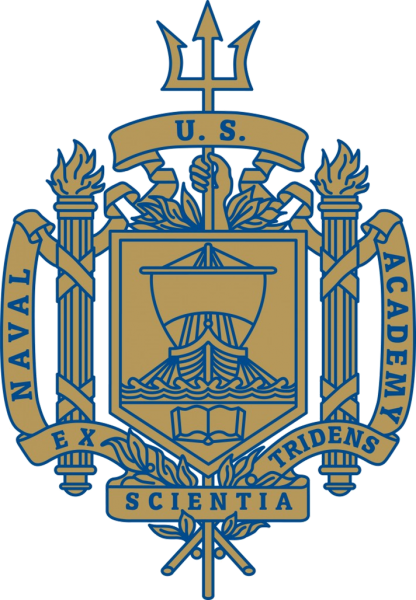 We will be taking a bus for a full day campus tour of the United States Naval Academy in Annapolis, Maryland. While in semester students have received the permission slip in class, ALL cadets both in and out of semester are eligible to join us. Read the permission form carefully and provide the forms with teacher/parent signatures and the fee to reserve your spot on the bus. If out of semester, please download and print the attached permission slip below. All NJROTC field trips both leave and return from Governor Thomas Johnson High School. Please contact Chief Rodrigues or LtCol Lyon with any questions about the trip. 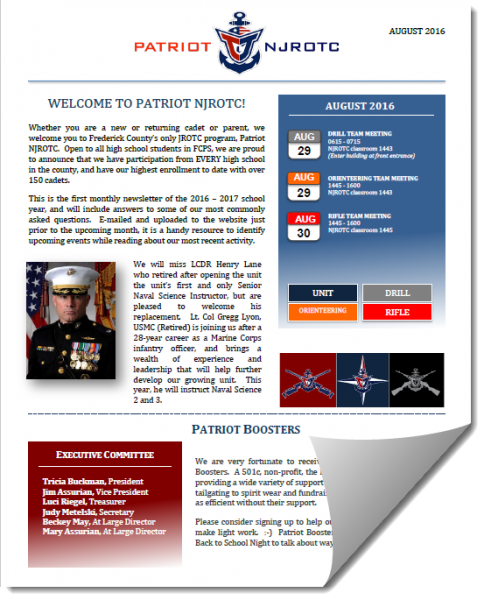 Attached is the August 2016 Patriot NJROTC newsletter. Each newsletter will share upcoming events in a calendar format while highlighting current news and team results. If you have a suggestion for the newsletter, please don’t hesitate to share it with us. Unfortunately, I missed a few main points for our out of semester and out of district cadets at our recent back-to-school night. Please refer to our FAQ section to find answers to the most commonly asked questions about our program. In short, regardless of your home school our what semester you are in a Naval Science course, we are a year round program, and cadets can participate in all teams and events year round. This does pose a communication challenge, but we hope this website, newsletter and our social media platforms make it easier to follow and share the most up to date information. Please join us at Back-To-School night, Wednesday, August 17th from 5:00 – 7:00. Though intended for incoming and returning T.J. students, the NJROTC program uses this event to welcome ALL cadets from both in and outside of Governor Thomas Johnson. If you will be joining us from another Frederick County school, we encourage you to join us for a parent information presentation and student information session with returning cadets. This event is also (especially) suitable for those not attending our program until the Spring. The NJROTC presentation will take place in the T.J. main auditorium at 1800. All students will be escorted to our classrooms after a welcome introduction, while the parents remain for a 30 minute presentation. Immediately following, we will join the students and answer any questions you may have. In addition to the presentation, our NJROTC Boosters will be selling unit clothing and meeting new parents.